Monument to the Cyrus Cylinder in Balboa Park, San Diego, California erected by an Iranian émigré organisation, presenting a widely-circulated false translation of the text that portrays Cyrus as a champion of human rights. 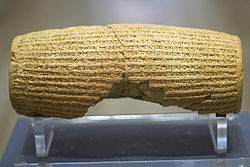 "Iran demands $300,000 from British Museum over Cyrus Cylinder delay"। The Times। ২০১০-০৪-২০। Iran is demanding that the British Museum pay $300,000 (£197,000) after it refused to hand over the Cyrus Cylinder — a cuneiform tablet regarded as the first declaration of human rights. Nayeri, F. (২০১০-০১-১১)। "British Museum Postpones Sending Artifact to Iran"। সংগ্রহের তারিখ ২০১০-০৬-২৫। 'The agreement has been made with our colleagues in Iran that we'll postpone the loan to investigate this exciting discovery with them,' said Hannah Boulton, head of press and marketing at the British Museum. 'That's the reason for the postponement.' [...] Boulton said the latest postponement had no link to recent events. 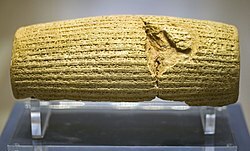 The Cyrus Cylinder। Inscription in room 55: British Museum। For almost 100 years the Cylinder was regarded as ancient Mesopotamian propaganda. This changed in 1971 when the Shah of Iran used it as a central image in his own propaganda celebrating 2500 years of Iranian monarchy. In Iran, the Cylinder has appeared on coins, banknotes and stamps. Despite being a Babylonian document it has become part of Iran's cultural identity.